But, fortunately, my segment is still in the show and is scheduled to air Friday, April 1, 2016 at 11pmET/10CT/9MT/11PT. It is the sixth episode in the series and is titled Bigger is Better, whatever that means. You can find additional information on the History Channel website about the program and view episodes that have already aired. You will need credentials from a cable provider to view it online. Since I don’t have a television, I use my sister’s account. It will also play at other times next week so check the program schedule for your time zone. I haven’t seen what they put together for the massage chair segment, but the episodes so far have had very high production values and create a good story. They interviewed myself, Serge Bouyssou, and my friend, Carlin Holden. I am still a little nervous that it is being aired on April Fool’s Day, but keeping my fingers crossed that it won’t make me look like a jerk. The timing, however, is great since this is the 30th anniversary of the appearance of first massage chair. 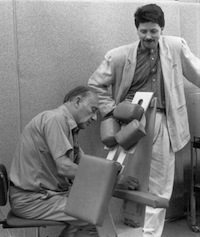 We are enhancing our website and collecting stories and pictures about the original Living Earth Crafts (LEC) chair and the very earliest days of seated massage (pre-1986) when there were no chairs. This collection will be the permanent archive dedicated to the original massage chair and the pioneers of seated massage. If you would like to contribute photos, videos or audio stories to this effort, you can email me at dp@touchpro.com. If you have memories you would like to share, please leave comments below. What was your reaction the first time you saw a massage chair? The first time you received a chair massage? What happened the first time you tried to assemble or disassemble an LEC chair? What was the reaction of your first customers? Right now you also can read some wonderful memories in the comments section at the end of this article: The Story of the First Massage Chair. This entry was posted in Chair Massage, History and tagged David Palmer, Living Earth Crafts, massage chairs. Bookmark the permalink. I own 2 of the original massage chairs. I can take pictures.